Felix Scheinberger is one of my most favorite sketchbook artists. His book, Urban Watercolor Sketching, lives on my bedside table and goes with me on almost all of my vacations. I use his work as constant inspiration to loosen up my own line, and capture what I see and how I see it. I struggle with this, the loosening up part. Anyhow, here are some loose scribbles I made of myself and my dogs recently. While on one hand none of us looks much like these scribbles, on the other hand, these scribbles do sort of capture something very true. 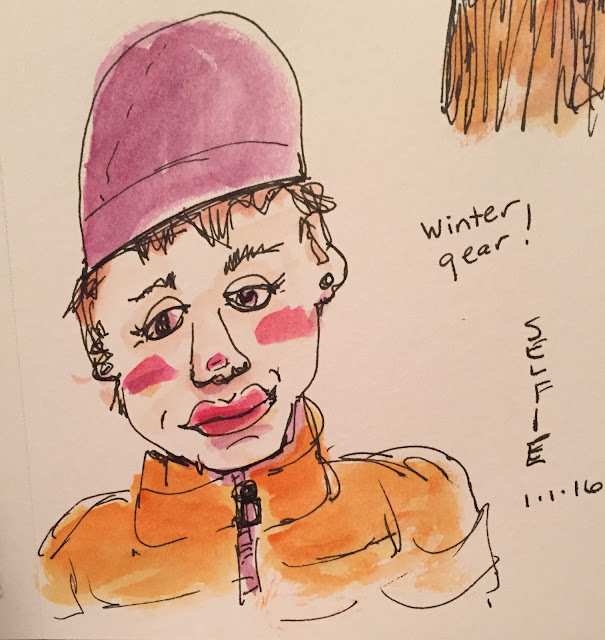 Me, out in the snow in my old orange puff coat and bright fuchsia hat, staying out in the wonderful cold until my nose and cheeks turn bright red. 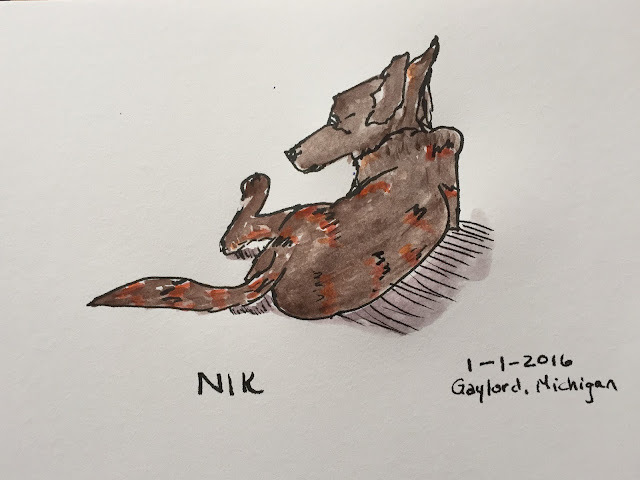 Nik, in his favorite "lounge and listen" position. 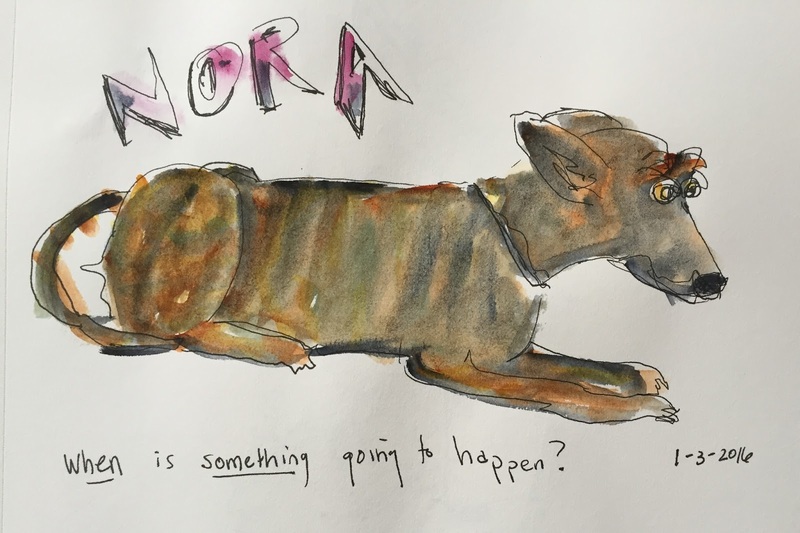 Nora, lying there, not really relaxed, but ready to spring up at a moment's notice to do whatever thing happens next. Each of these took me only a few minutes to capture. This is what I want to learn to do more of--quickly rendered scribbles that capture something authentic about the subject and about how I see the world. Little sketches that fit into the tiny chunks of time during a busy life. Scheinberger will be teaching a week in my current Sketchbook Skool klass very soon! I am sure looking forward to that! I do think that my nearly two years of carefully observed subjects and sketches have helped my quick, loose scribbles be more descriptive of the subjects. So I will keep doing both as I move into this new year: pay attention and capture as closely as possible. Render detail, and lots of it. And balance that with more of these quick, loose pieces. Let each influence the other!